It’s this last phrase, that something is coming in the next few weeks, that has set off a new round of speculation that perhaps Microsoft intends to reveal Office for iPad on stage at Apple’s iPad 3 event, which is rumored to be taking place in early March. But would Microsoft use an Apple keynote to demo Office for iPad? Dan Frommer from SplatF comes out heavily in favor of Microsoft being involved in the iPad event, with Apple using Office for iPad to showcase the capabilities of the iPad 3, which would further lock up Apple’s lead against competing tablets in the workplace. John Gruber doesn’t quite agree, mostly because he feels that Apple doesn’t need to share the spotlight. The YouTube ID of WxOp5mBY9IY#t=0ms01s is invalid. Back then, Apple desperately needed Microsoft to infuse some cash into the organization and some confidence into its customers at a time when it was nearly bankrupt. Nearly 15 years later, the roles are neatly reversed, and Apple is in the driver’s seat for both the phone and tablet markets, while Microsoft is looking to stay relevant with its still-important Office business. In 1997, Apple was eager to cement their relationship with “meaningful partners” like Microsoft, to borrow a phrase from Steve Jobs’ presentation video, embedded above. In 2012, even though Microsoft is nowhere near bankruptcy, that relationship might well look quite different. 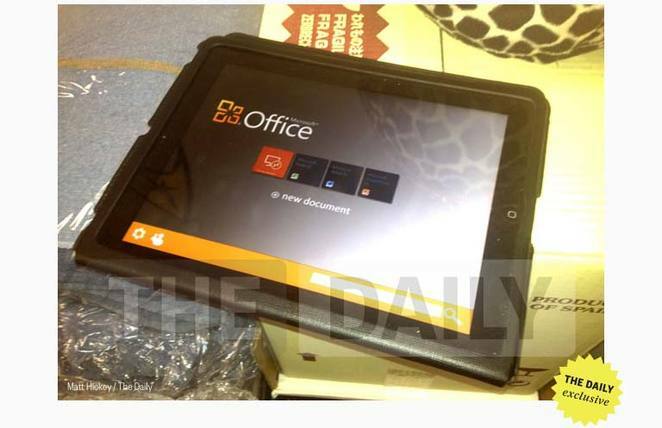 Where will Office for iPad save its documents? Would Office for iPad save documents to Apple’s iCloud? Or will it use some Microsoft technology like SkyDrive, Office365 or Sharepoint servers? Or will it be some combination of all of the above? Office is critically important to Microsoft. It still generates enormous revenues and, more importantly, huge profits for the Redmond, Wash., company. For Office to stay relevant in today’s always-connected workplace, a successful mobile strategy for shared documents is critical. ICloud is great for the independent user that wants to keep their own documents in sync, but it does not provide a complete solution for team collaboration in an enterprise environment. Sharepoint is central to internal collaboration tools in the enterprise market, and SkyDrive and Office365 are part of Microsoft’s hosted collaboration solutions. If Microsoft were to adopt iCloud for users to save personal documents and Sharepoint integration for team collaboration, that would signal that Microsoft is willing to concede the personal market to get Office on the iPad in order to keep iOS devices plugged into the workgroup and enterprise solutions from Microsoft. If Office for iPad only saves documents to iCloud, then Microsoft plainly agrees.